Soak ancho in hot water until soft, about 30 minutes. Drain and discard soaking water. In a blender or food processor, combine cranberries, ancho chile, honey and salt and puree. Add enough hot water to make the marinade pourable. Pour marinade over pork. Marinate for at least 4 hours or preferably overnight. Remove pork from marinade and skewer. Grill over moderate fire until cooked through. Best with wood smoke! There is enough marinade for a pound of pork, maybe a bit more. Combine all ingredients except chicken in a blender or food processor and puree. Pour marinade over chicken and marinate for 4 to 6 hours. 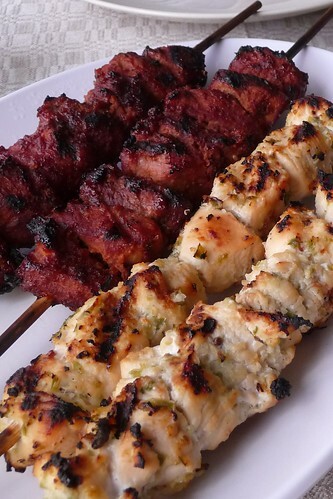 Remove chicken from marinade and skewer. Grill over moderate heat until cooked through. As with the Cranberry-Chile Pork, this marinade makes enough for at least 2 large chicken breasts. This entry was posted in chicken, dairy-free, gluten-free, holidays, latvian, pork, recipes, russian, untranslated. Bookmark the permalink.